All I have to do is look at Formula E racing. Their races are rarely longer than 100 miles and yet they need two cars to finish the race. However, Norway IS investigating technology that could very well make EVs far superior to the ICE. They are putting rails in a section of highway that are 50 meters long, with breaks in between each segment. The "rails" are embedded in the road and apparently charge an EV's battery as it drives over the rail. This would seriously reduce or eliminate fuel stops for long distance trips. And being a Nordic nation, you know they'll be making sure the tech works in the freeze-thaw cycle so familiar to us. If this turns out to be a viable idea, I can see the ICE powered vehicle disappearing rather quickly. But then again, you better make damn sure your electrical supply is secure and in top-top working condition all the time. I can imagine a 2-3 day power outage and the highways crammed with stranded vehicles and spoiled goods. Speaking of Lambos their Vancouver dealership is a block from where I live-just on the other side of Burrard. It's a sad place-all that money flying around for incredible machines that will never be tested anywhere-not only are the drivers certified cucks of the most limp wristed variety this place lacks decent roads-too many twists & turns/sharp braking needed to even get to 150 kph I'd go nuts trying to drive one around here. Somebody crash and burned their Diablo. The carcass is at the auto auction in Richmond. There's only one way you can know they're cucks. Have you been spreading your wild oats with other men's wives? What does that say about your character? Somebody crash and burned their Diablo. The carcass is at the auto auction in Richmond.What a mess. Becoming more & more common they just can't handle all that power in such a short time-there are courses a person could take but first they'd need to understand a course is necessary. There was a lime green lamborghini running around 2 years ago with an N magnet. They're going to need about 10,000 miles of that recharging rail for Saskatchewan's gravel roads alone, not sure how seasonal grading is going to work. Could be a challenge, the province can't even afford to fill the potholes in the spring, let alone install and maintain new high-tech charging rail. It seems these new tech ideas like autonomous vehicles and integrated charge systems for EV's similar in utility and practicality to trains, very efficient and practical where specialized infrastructure has been installed, but of limited to no practicality in most average locations. I think the ICE is going to be around for a long time yet, barring any new innovative fuel source that may be found that actually challenges fossil fuels in efficiency and economy. Maybe Lamborghini doesn't know about these. It should, the Rimac beat the pants off it in a race on the Grand Tour motor program. They're mad because Tesla destroyed them on the track. Last edited by Hoid; Jun 26th, 2018 at 11:00 AM.. There is a absolutely massive reason why they don't know about them. Read what you link as fact sometime. Concept cars, especially supercar concepts, are more for looking at than actually driving — made to spark discussion, rather than reach any destination. Destroyed who, where and with what? A concept? Let's try to understand technological progress. The model T, the electric light, and even the internal combustion engine started out as concepts. Every new invention does. Electric cars are not going to go away just because you don't like them. The last time a radically different type of engine beat the pants off conventional engines so many restrictions were placed on it that they became useless. It is only a matter of time until electrically powered vehicles can outdo most internal combustion engines. I suspect when that happens sports like Formula 1 and stock car racing will ban them. The last time a radically different type of engine beat the pants off conventional engines so many restrictions were placed on it that they became useless. Would you care to share your knowledge of this revolutionary machine with us? It is only a matter of time until electrically powered vehicles can outdo most internal combustion engines. That may happen but since there's no timeline it's of little interest to anyone-except investors many of whom started out in oil. I suspect when that happens sports like Formula 1 and stock car racing will ban them. I don't suspect I know you're FOFS. Look up turbine engine Indianapolis 500. Your second statement makes no sense and your third indicates you are a another angry electric car denier. Too bad. You're going to be disappointed. We got them in electric now too? In 1974 Sky Lab was this first step to villages on the moon by 1990. IDK if they get banned it would prove they can go the distance and if they can be competitive I would look at them in a different light, not as a gimmick and a joke. Apparently someone managed to fit a small airplane gasoline engine into a race car but it never performed properly and ended up in the Smithsonian. There have been oodles of variations but at Indy it's open. You could have 30,000 rats on a treadmill. NASCAR is a complete and total differ set of rules. You or I have to be able to buy what they run. $10KUSD for an engine but they are available. When an electric wins Daytona then I'll I'll be the first guy to buy one. Mr. Barilko did not ask that. He asked what engine was handicapped after it was shown to be superior to conventional engines. Get in the loop before you post. There is no problem checking the facts of my post. Although mechanical problems sidelined the turbine car in the Indie 500 it was running away with the race at the time. Sponsors of the race did not like the idea of a new type of engine making conventional engines look ridiculous and regulations were passed that handicapped the air intake of the turbine, essentially making it non-competitive. As I said, I doubt that the race organizers would let in an electric car. The Daytona is heavily sponsored by oil companies. Bill Nye wrote a widely read piece urging NASCAR to go all electric and help push the technology. There is no way NASCAR will ever do that. As in all things NASCAR will have to be dragged into the future. As you mentioned they are an oil and gas sponsored industry. Stands to reason. After all it is a car race, not a sewing machine race. That's because it is all about pistons, not cordless sewing machines. COLORADO SPRINGS, Colo.—All it took was two visits to the annual Pikes Peak International Hill Climb for it to steal our hearts. The second-oldest motor race in the United States—only the Indy 500 predates it—is unlike virtually every other professional motorsports event we cover. And this year's edition proved to be novel in its own right. 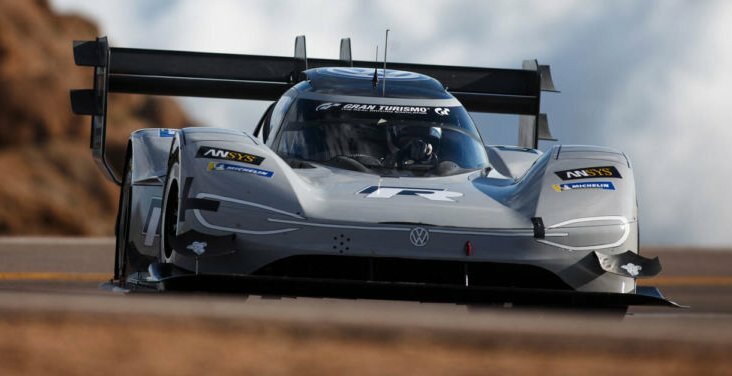 Last weekend, we were on hand to witness French racing driver Romain Dumas and car maker Volkswagen stamp their authority on all 12.4-miles (19.99km) of the course, destroying its existing record and setting the first sub-eight minute time in race history. What makes the feat even more interesting around Ars is that the car in the record books is all-electric, marking perhaps the first time in major motorsport that a battery electric vehicle has beaten the internal combustion engine fair and square. In retrospect, if any car has an advantage at Pikes Peak it's the EV. The start line is already at 9,390 feet (2,862m) above sea level; the finish line is an even higher 14,110 feet (4,300m), and much of the course is above the tree line, where there's 40 percent less oxygen to breathe. Consequently, internal combustion engines will lose power—significantly—as they climb the route, even with the aid of forced induction or crafty fuel mixtures.